How far will you go to listen to your customers? Whatever your answer, I know this much: It’s not nearly as far as Sage has gone. Officials with the software giant are spending the summer driving cross-country in a souped-up RV to visit customers and ask them what they need from their Sage products and services. 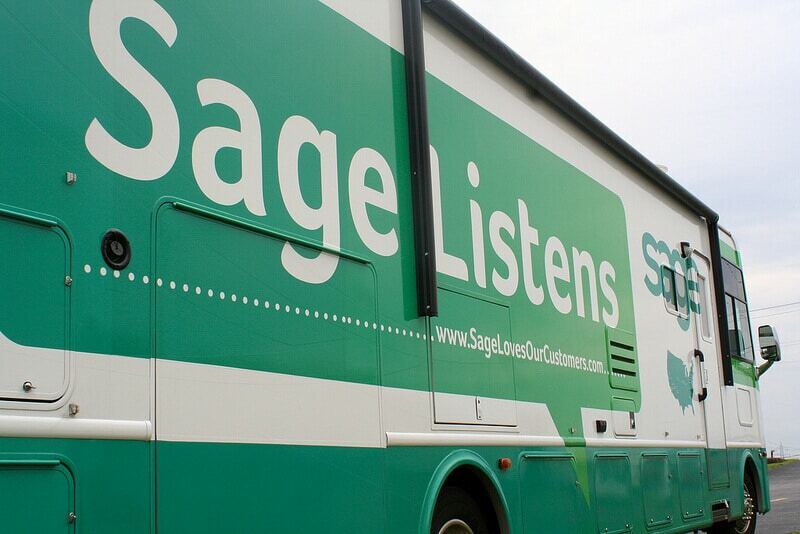 Dubbed the “Sage Listens RV Relay,” the tour covers 16 cities in 50 days, from as far east as Boston to the Aug. 28 conclusion at the company’s headquarters in Irvine, Calif. Along the way, Sage officials plan to be customers to their customers – to eat at customer restaurants, stay at customer hotels, and purchase gas and snacks from customers – and they’re asking others to shop locally, too. The ultimate goal? To listen to – and learn from – their customers. Taylor was among the Sage folks on board when the RV rolled onto the lot at VIP ADI in St. Louis at the tour’s midway point. VIP, a distributor and installer of automotive products and accessories, has been a Sage customer since 2001 and just recently upgraded to the latest edition of Sage 300 ERP. VIP officials took full advantage of the opportunity to offer feedback about the software. And therein lies the secret of outstanding customer service – doing not only what’s expected, but what’s unexpected. The company’s own Jennifer Warawa calls it “surprising and delighting” your clients, going above and beyond when it’s least expected. An extended summer road trip sounds like a great way to start. The MACPA will be joining Sage and Jody Padar’s I C Opportunities tribe in Las Vegas on Aug. 17 for a “parking lot party.” We’ll be learning more about providing top-shelf customer experiences and having a bit of fun in the process. If you’re interested in joining us, you’ll find details here. In the meantime, we want to hear your stories. How are you delivering memorable customer experiences and client service?